Without even noticing it, a lot of our life consists of repetitious behaviour. The alarm is set at the same time and we run through the same procedures each morning. We get up and get ready for work. We get to work, start the computer, and gab with our colleagues who have become friends. We probably then all go to the cafeteria for a coffee and breakfast. We enjoy our coffee and breakfast while we gradually dither into our day. The day, for most people especially in an office, is the repeat, repeat, repeat of the mundane activity: creating Excel spreadsheets with the same sort of information day in and day out; obsessive photocopying because we don't trust computers to keep our records; filing those papers; have lunch; discuss how much we hate our job/boss/life. Repeat the next day. Regardless of how important we might think this “work” is, the truth of the matter is it is soul-destroying and, to an alien observing us from another planet, probably high comedy. 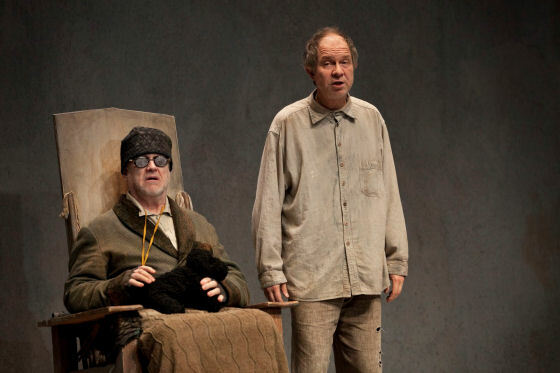 Samuel Beckett's Endgame is about many things (both tragic and comic), so many things that I'd have to see or read the work more than once to decipher it all, but in my first go-through during Toronto's Soulpepper Theatre Company's sublime production (on now until November 17), the pointless repetitions in life is what hit home the hardest. In a post-apocalyptic world (or is the post-apocalypse just in the characters' minds? ), Clov is the caregiver for Hamm, an old man who can neither see nor walk (Clov can walk and see, but cannot sit down). Is Clov Hamm's son, or is he a boy he stole from a man many years ago and now has him trapped in indentured servitude? Yes and no. Beckett lays out both scenarios but never reveals which is the real story (leaving it up to us to decide). Clov moves like an injured penguin and has a laugh like an otter. His day is spent in a mundane series of activities: moving back and forth between two windows that need a small ladder so he can look out them. He looks out one window and laughs, moves to the other, forgetting the little ladder, shuffles back to get it, goes up it, looks out and laughs. You know that he does this same thing, and other things, every day, and every day he probably makes the same series of mistakes. He pulls sheets off two garbage cans that sit in the grey, dreary room. (Inside the garbage cans are an older man and woman, Nagg and Nell, who may, or may not be Hamm's parents. They have no legs and thus are confined to the dustbin – as many old people, metaphorically, are.) Clov then pulls a sheet off of a sleeping Hamm as he sits at centre stage in a ramshackle wheelchair. The vision Beckett gives here is bleak – a view he held of all mankind. In this world, no one can or will touch anyone else (whenever Clov hands something to Hamm he pulls his sleeve down over his hand). Nagg and Nell are beholden to Hamm and Clov for food and to clean their cans, just as much as Hamm is beholden to Clov's assistance, and Clov cannot break from the autocratic Hamm. Through a series of actions and reactions, Clov spends the play dashing here and there trying to please Hamm. It is an impossible position that he is constantly threatening to quit. He says repeatedly, “I'll leave you,” which of course has a double meaning: I'll leave you forever; I'll leave you to your own devices until you need me again. The play, for all its terrible darkness and horrifying view of humanity, is also frequently very funny. Two lines in particular I recall are, “Nothing is funnier than unhappiness” (spoken by a bedraggled Nell as she peers out of her garbage can), and the head-spinner, “If I don't kill that rat he'll die,” said by Clov. These people are trapped in a cycle, a cycle that looks to be about to start all over again at play's end (a tableau with a frozen Clov staring at Hamm as Hamm speaks the play's final lines) because a few moments before the end Clov, through the window, has spotted a boy on the blasted landscape. Will Clov replace the dying Hamm and will the boy replace Clov to become Clov's indentured servant? Likely or maybe not. What I have always greatly admired about Soulpepper is their willingness to match the crowd-pleasing (Neil Simon's The Odd Couple) with the challenging (Endgame and Eugene Ionesco's Exit the King – a play, by the way, that shares many of the same thematic ideas as Endgame). Wisely, where an Odd Couple will run throughout a repertory season (it pays the bills), an Endgame only plays about three weeks. It makes good economic sense because a play like this, sadly, has a very limited appeal (though the show I saw, a week after opening night, was pretty full). At the start of this season, artistic director, Albert Schultz, asked writer/actor/director Daniel Brooks what play he'd like to direct this year. His immediate response was Endgame. 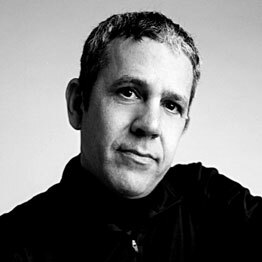 During Soulpepper's 1999 season, Brooks had directed a production of the play that went on to win Best Play that year at the Dora Awards (Toronto's Tony Awards). I never saw that production, but I can see the appeal for a director to return to a challenging work like Endgame. Just as the audience (or reader) would get different things from a work like this, so would a director. The different approaches he made, I cannot comment on, but I will say this production is uniformly wonderfully acted, designed and lit. Joseph Ziegler (so good earlier this year in Soulpepper's A Long Day's Journey Into Night) is a terrifying, demanding monster who holds complete sway over this microcosm of life. Eric Peterson is mischievous and demanding (“[Give] me SUGAR-PLUM”) in equal measure as Nagg. Maria Vacratsis is wickedly funny and deeply sad in her brief role as Nell. But it is Diego Matamoros (the only actor reprising his role from the 1999 production) as Clov who is the true revelation. His physicality tells you as much about his character as his mournful, incriminating looks and comic/tragic dialogue. His voice is set at a locked gravelly rumble. He manically tries to please and would just as happily love to kill Hamm. What he did differently from 1999 I cannot tell you, but this performance is both disturbing and funny in equal measure. The bleak, grey set by Julie Fox is of a world stripped to the bone. Even the pictures on the wall are just empty frames with their backs facing out. The lighting by Kevin Lamotte is harsh and blinding, as it should be. But it is the final moments as the loud, cranking curtain slowly descends that the lighting is most powerful. Using a light the floods straight into set (not from above) creates a razor-like line where the curtain eliminates the light on stage as it slowly descends. As it comes down, it is like it is decapitating the remaining cast. This production is not on for much longer, just another week, but by all means see this. We don't have enough demanding theatre in this city put on by the more commercial houses, so the fact Soulpepper is doing it is reason for celebration itself. The fact they did it so well is the cherry on top. I go to the old folks matinee on Wednesdays. There were quite a few empty seats, and had there been an intermission, I suspect that many would have left the theatre. My wife and I were among the few who laughed at the appropriate (of course) moments....It was a great play, and I hope Soulpepper continues at least one absurdist play a year.